Happy (Australian) Mother’s Day! Just a very quick post as I have been baking most of the weekend so that I can spoil my Mum with high tea this afternoon, and I have to leave soon to get to my parent’s house. My Mum has her birthday, Mother’s Day and wedding anniversary within the same week and I always try to make it special for her. Hopefully she will enjoy all my baked treats (I’ll update this post with links to what I have baked later…my Mum reads my blog and I don’t want to spoil the surprise). However, these are not part of the high tea today. I actually made these for my Mum for Easter, however they make a great edible gift any time of the year and are great for chocoholics. It is more of an idea than a recipe. As such I haven’t given quantities, you can make as few or as many as you like based on the size of your moulds and the amount of chocolate you use. I first saw these in a magazine last year and have seen them in quite a few since then (too many to reference). I haven’t used them myself yet to make hot chocolate; however Mum has said they work really well, with the chocolate melting into the hot milk to make hot chocolate perfectly. So next time you are in search of a gift, why not give these a go? As I’ve mentioned many times before, I’m not that fond of chocolate (strange I know). I will always bypass a chocolate dessert for something made from citrus or berries. If I am going to eat (or bake) something with chocolate, I need something added to it to cut through the richness of the chocolate. 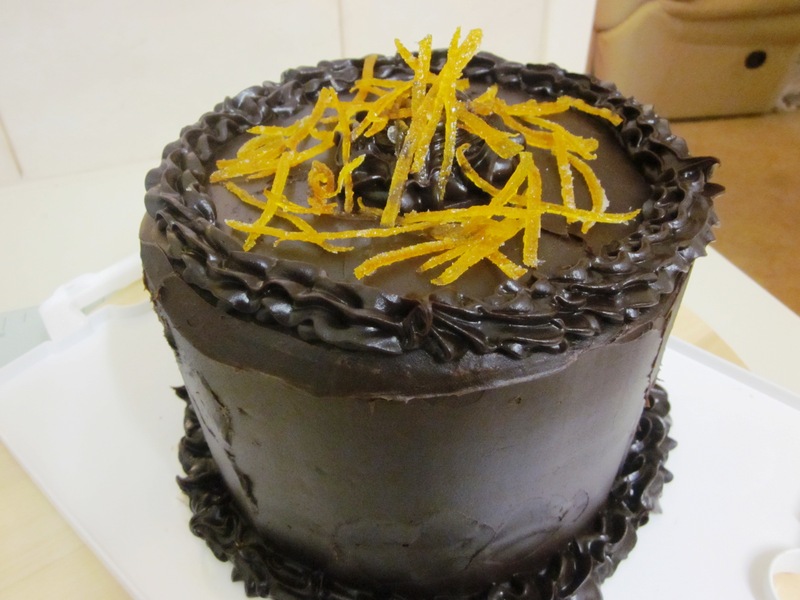 When I saw the cover recipe of the March BBC Good Food magazine, with the classic combination of chocolate and orange, I knew it was something I wanted to try. And with a house warming to go to this weekend, it was the recipe for me. The recipe in the magazine used store bought sweet crust pastry, with cocoa added to it in a food processor to make a chocolate pastry. I decided I had to make the chocolate pastry from scratch. Not the best plan when you only have a few hours to make the whole tart at the end of the week and the house/kitchen is boiling hot (it is a warm summer here in Perth). But I persevered. If you can give the pastry a couple of hours in the fridge it is much easier to work with and you can roll it a bit thinner. I had to make it a bit thicker as it wasn’t quite cool enough when I rolled it…but the end result was still good. I also wanted to make small individual tarts as I thought that would be easier at a house warming than a large one that needed to be cut. The filling for these is almost like a cross between a curd and a custard. Don’t take your eyes off it when it is on the stove. I went to check the pastry and it started boiling and almost curdled. Thankfully it still worked and the end result was a good combination of the rich chocolate from the ganache drizzle and pastry, and the sweet tartness of the oranges. I used my favourite ganache recipe instead of the one in the magazine which had the addition of golden syrup as I thought this would be too sweet. The recipe below has more ganache than you’ll need to drizzle on top of the tarts. 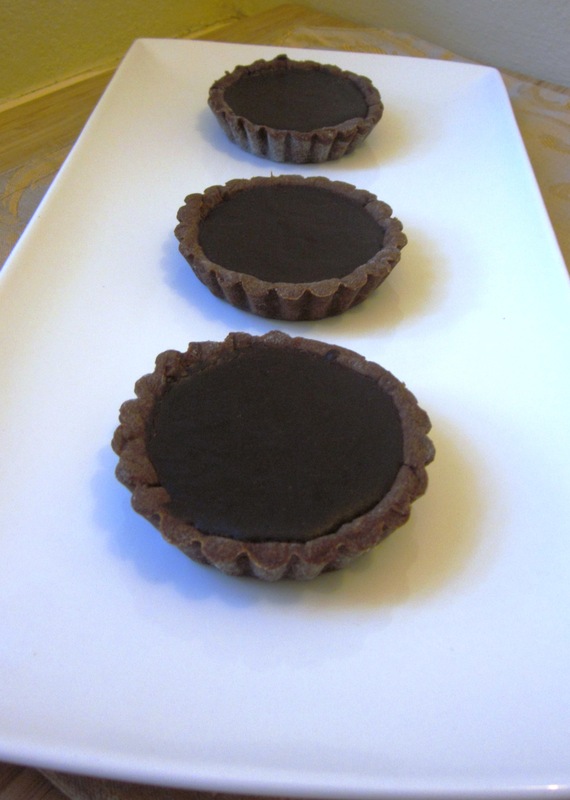 However I had extra pastry so I made more tart shells and filled the rest with the ganache for rich chocolate tarts with a hint of orange in the pastry and ganache. With ginger, cinnamon and mixed spice filling the air, it’s really starting to smell like Christmas in my house as a result of this weekend’s baking. Aside from starting the gingerbread for some mini gingerbread houses (a future post), I also came across this recipe for gingerbread brownies that I had to try. Not being a huge chocolate fan, brownies are usually too rich for me (although my fudgy chocolate and raspberry brownies are very popular with all the chocoholics I know). But I liked the idea of the added “Christmassy” spices and just had to try them. With the amount of chocolate in this recipe (both dark chocolate and cocoa), they were too much chocolate for me and I could only eat a small piece. But that is my issue, not the recipe’s. Besides, heading into Christmas time when most of us over indulge, only having a small piece of something is a good thing! 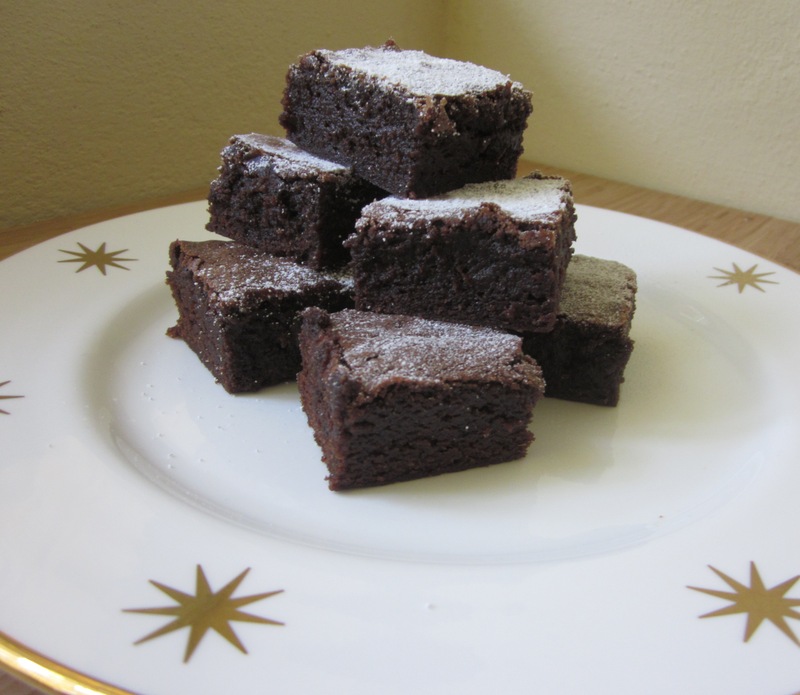 They were very popular at work so, if you love chocolate brownies, why not give these a try instead of your usual brownie recipe at Christmas time? This would be great as a dessert warm with ice-cream too. I’m finally back to baking and blogging after more than a month away. My apologies for my absence, but my other hobby was taking up all of my spare time. As I have mentioned before, my other passion is musical theatre, and I was cast in a local (community) musical theatre production, which hit the stage recently for a one week run. And so my time was taken up with rehearsals and then performances. However, the musical has now finished and it is back to cooking, cooking classes, baking and blogging. The show went well, with great feedback from the audiences. The best part was meeting all the children from the audience in character after the show. They loved that. It was a lot of work and over too quickly, but well worth it. It has reignited my love and passion for musical theatre! But for now, there are no more shows on the horizon so I have more time for my baking and blogging. The final episode of GABO is now a distant memory, however I set myself the challenge of cooking all the technical challenges, and there is only the final weeks challenge left to go, LA Religieuse. However, as usual I did change it a bit. 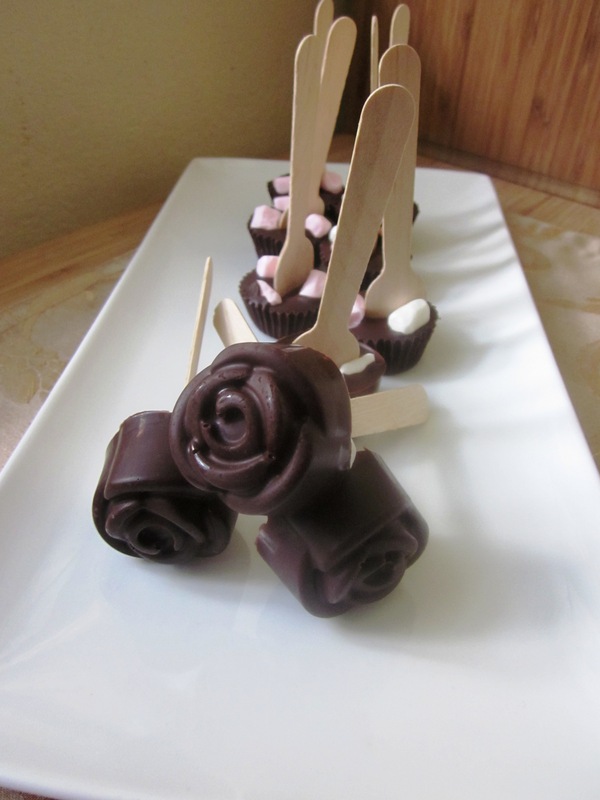 I decided to just do chocolate and vanilla filled versions, rather than the chocolate, coffee and rose. I have to say I had issues with this bake. Even though I’ve made both choux pastry and crème patisserie before. Part of it could have been that I was recovering from a migraine when I first started on Saturday, and the rest was not reading the recipe correctly and then rushing and taking short cuts at the end. 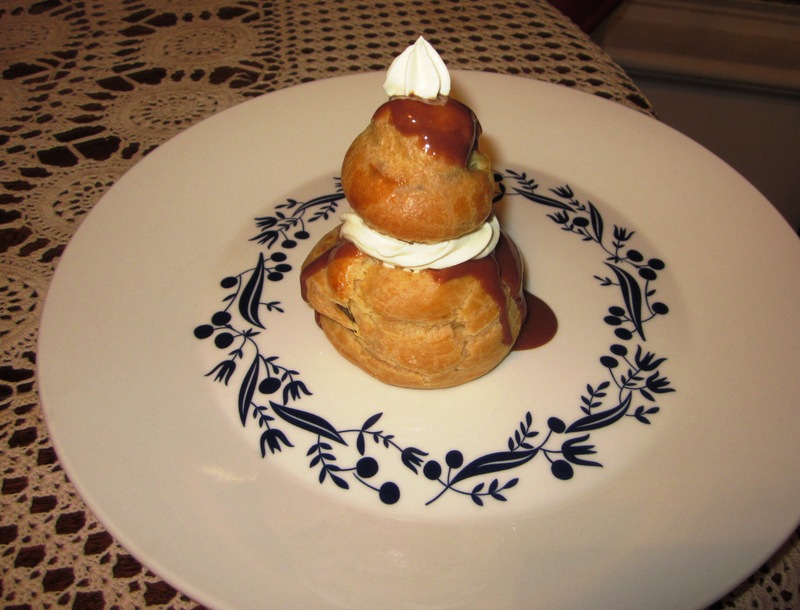 My first crème patisserie was a bit grainy (the sugar hadn’t dissolved using the GABO method which had the sugar in with the milk) and I put the large and small choux pastry in the oven at the same time instead of cooking them separately. So after enjoying some fresh air and sunshine at the Unwined food and wine festival in Subiaco today, I decided to start again. This time I used my normal crème patisserie recipe (which I much prefer) and cooked the choux in batches as it was supposed to, with much better results. I have to admit though, by the time I got to the assembly stage I was tired and rushing. My icing was too runny, and I didn’t want to make a second batch. And I used whipped cream instead of melted white chocolate which wasn’t firm enough. So they weren’t very pretty in the end and not very stable. But they still tasted nice and the choux pastry itself turned out great. I have to say next time I will just cook éclairs or profiteroles, which can all go in the oven at one time, and they are much easier to assemble. All in all, after the first failure, I was pretty happy with the outcome taste wise, although they are a very sweet and rich dessert. I am very happy that I managed to get through all 8 of the technical challenges (some better than others). Of course, cooking in your own kitchen is completely different to the high stress environment of the GABO tent, but who knows…I might have read the recipe properly if I was there! Next up? I start a 5 week Christmas Baking Class with Sarah Brigden from babyCakes this week. And finally the show stopper, where each week they are asked to create something creative with wow factor. One of the things I love about this show is that for two of the challenges, the contestants get to work off their own recipe which they know and have been able to practise. It is so important in baking to get the measurements/ratios right that it has always amazed me that people in other reality TV cooking shows can bake all manner of things from memory. I know that, even though I’ll often change things and add my own flair, in baking I still always start by looking at the recipe! The technical challenge for week one was a chocolate and orange checkerboard cake and I just had to make it for my Dad’s birthday. The cake recipes themselves seemed quite easy, however my first hurdle was that I didn’t have the right sized tins (four 18 cm tins were required for this recipe). I managed to find one tin in a little homewares store down the road; however this meant that I had to cook four cakes separately rather than all at once. There was certainly no way I was going to be able to make this in the two hours the contestants had! If you have the time, I would suggest making the cakes the day (or at least the morning) before you want to assemble them to allow them time to cool in the fridge (or freezer). They are much easier to cut and assemble cold (the first cake I made was a lot easier than the last, which was still slightly warm). I only made three rather than four levels as I had to transport it the next day (although you still need to make four cakes to get the desired pattern). And I also felt that the three levels was more than enough. This cake certainly has wow factor when you cut into it. I have to admit I was very excited when my Dad sliced the first piece and we could all see the checkerboard pattern inside! I have to confess that, at the request of my Mum, I used my usual ganache recipe rather than the GABO recipe. . I also found I needed to use extra orange zest to get the level of flavour I was wanting. It is quite a rich cake and I would definitely recommend serving it with cream or icecream. But on the whole I have to say that my first technical challenge was a great success. On to the week 2 challenge! It is only recently that I have become confident enough to make my own pastry, rather than using premade bought pastry, and I am really looking forward to going to a pastry making class with Sarah Brigden soon to learn some more techniques, tips and tricks. For a lot of people though, the thought of making pastry from scratch is quite stressful. And I think cooking should be enjoyable, not stressful. 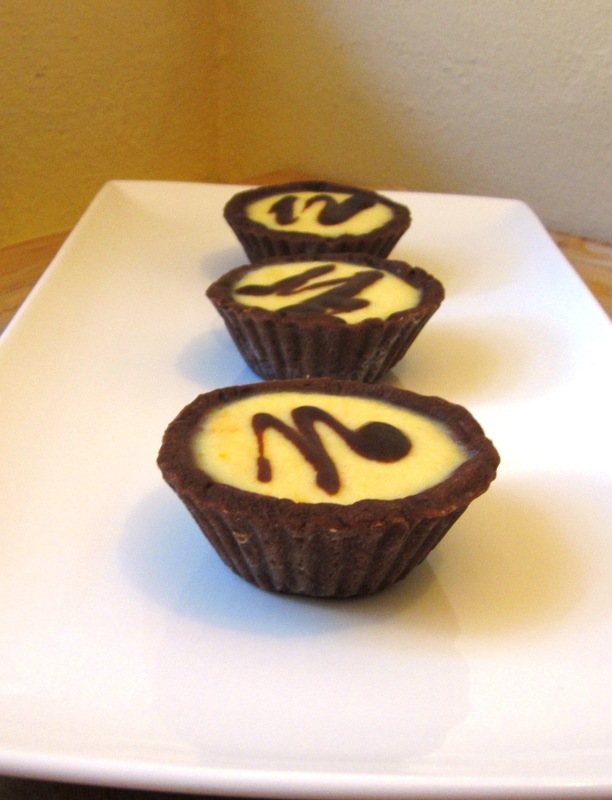 These tarts are a great alternative to a pastry dessert. Instead of a pastry base, they have a macaroon tart base, made from egg whites, coconut and sugar. The end result is a beautiful macaroon tart base, which is crisp on the outside and chewy in the centre with a rich and creamy chocolate filling. 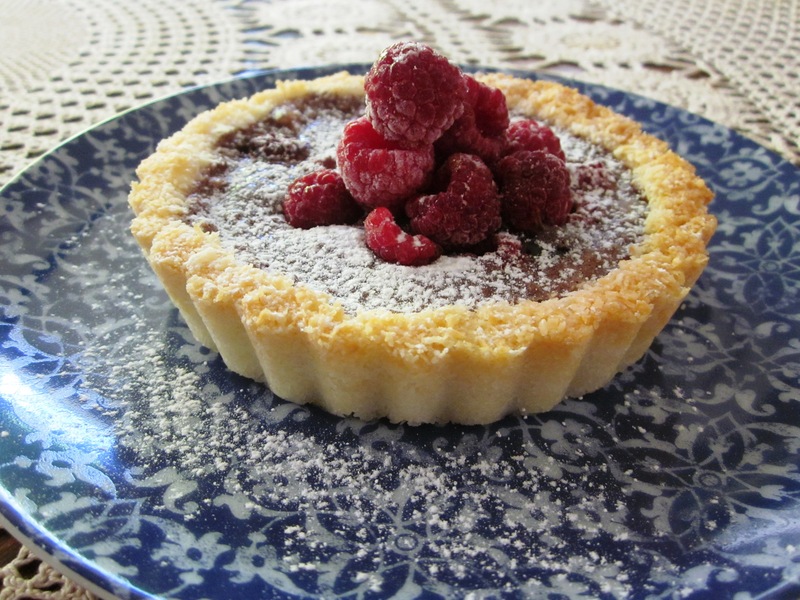 The tartness of the raspberries cuts through the chocolate filling, making it fresher and lighter. I think this is a great alternative to a pastry dessert and a great dinner party dessert as it can be made ahead for stress free entertaining.